There are few items more DIY friendly than paper lanterns. They are beautiful all on their own plus they are easy to customize with different lighting. Plus, they are so much fun to decorate with! Try bunching different colors together, adding paper butterflies or flowers, or attaching a lace trim. Paper lanterns are seriously the perfect addition to just about any wedding décor. They are so easy to customize! Use them for every wedding style from a simple backyard wedding to a bright, bold rock-a-Billy wedding. White lanterns with lights add a romantic glow to your dance floor (how cute is this wedding! ), or bunch bold colored lanterns together to make a statement. With so many colors and lighting options to choose from, you will be able to design exactly what you need for awesome wedding decorations. Our favorite way to use paper lanterns is to piece them together to create a custom, eye catching light fixture. Who says you have to spend an arm and a leg on custom lighting from a designer? Grouping several lanterns together creates dimension and can be used in a corner or over a table. 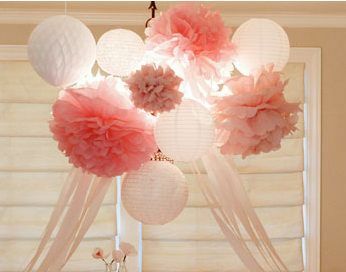 Are you addicted to decorating with paper lanterns? We’d love to hear about your designs!